Android Device Manager to help you locate and secure your Android devices. Since then Android Device Manager has helped reunite almost 30 million users with their wayward phones and tablets. Today we’re making Android Device Manager even more useful by introducing support for Android Wear to help you find your lost device. Misplaced your Android phone? No problem! Android Wear connects your phone to your wrist, and together with Android Device Manager, you can make sure it stays that way. To use this new feature, just say ‘Ok, Google. Start. Find my phone,’ or select the ‘Find my phone’ option in the Start menu. Your phone will ring at full volume, and you’ll be that much closer to, well, finding your phone. Best of all, you won’t need to do anything to enable this new feature. It’s rolling out to all Android Wear devices over the next few weeks. Your device may not have been updated yet. "It’s rolling out to all Android Wear devices over the next few weeks." no it has. The app is there. However i found that "start application find my phone" seems to work. Say "Go go gadget find my phone." Then report back. Nice! Just tested it on my LG GWR. It works but the execution is a little clunky. Hmm, it seems to be correctly hearing me, 'start find my phone' shows as it recognises, then it corrects itself to 'start find my iphone' and searches for that instead. Very frustrating. try "start application find my phone", that seems to work for some reason. Nope. Google seems insistent that I've lost an iPhone. Only way it works is 'start application find my ... phone'. Natural speaking is 'corrected' for me. Interesting, 'start app ...' works every time. Have you given Android Device Manager "Device Administrators" rights on your phone? The same problem with LG G and Samsung S5. 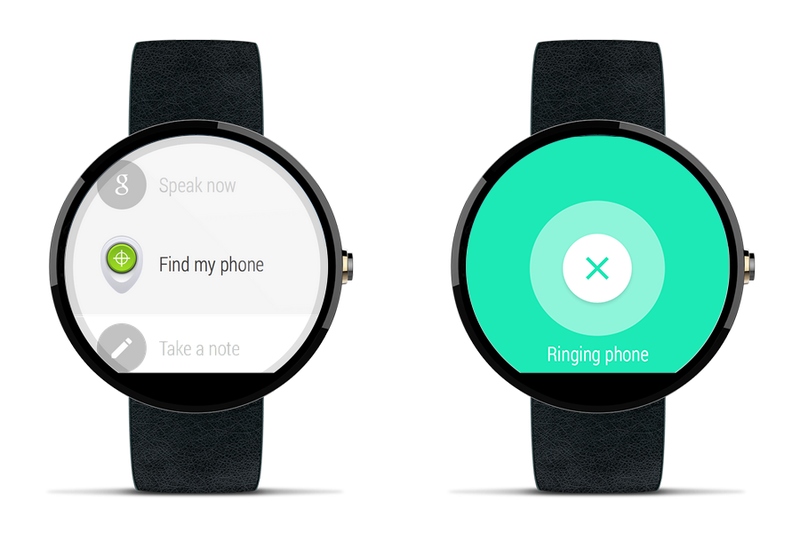 It would appear that the best way of launching the "Find my phone" app on the Moto 360 is by saying " Start Application Find my phone" at the Google "Speak now" prompt. It worked like a charm pinging my Droid Turbo! Thanks for sharing that bit of info. It's the same here, saying "start find my phone" doesn't work but "start app find my phone" works great. Alternatively just saying "start" will bring up the a menu where "Find my phone" is the first option. Cool, I always felt this was one missing feature from Android Wear. Works perfectly on my Moto 360 to ring my G3. 'Bout time! My Gear 2 Neo had this feature. When I got the Gear Live it didn't take me long to realize that it wasn't there. I wait in eager anticipation for my update. I wonder if live watch faces are coming next... I miss that from my gear 2 as well. Showing people that I had the Matrix or a live pacman game on my watch was pretty darn cool. I already use the fart app Waft to do this. And the kids love it! Stay classy Google. JUST KILLED MY MOTO 360's Battery! After trying the "Ring my Phone" feature about 2-3 times my Watch's battery drop from about 40% to 1% in about 45mins, WTF?? Buggy as hell. At first it didn't work. But I found the solution: I logged in at the online Android Device Manager on my laptop en made my phone (Samsung GS3) ring from there. It located my phone and it started ringing when I commanded it to. So that part works. Then I tried it again with the app on my LG G3 R and miraculously it worked there as well. Yeah!! how Google works? http://goo.gl/ZjZcsG like this page and Know More about Google. I want to know if there is compatibility between the Nexus 5, LG and Samsung Gear S.
Thank you for enriching us with this appealing article . Watch the ICC World Cup final Aus vs New zealand live on your mobile,laptops,pc etc. Just visit go2livetv and enjoy live experience at your home,office and wherever you are. thanks for sharing this useful app for android. Its cool. and good to hear.